Darr was not alone in vouching for Shah’s character. Three other elected officials, U.S. Rep. Sanford Bishop, Muscogee County Marshal Greg Countryman and Municipal Court Clerk Vivian Creighton-Bishop, wrote character letters for Shah that Land referenced in his sentencing. Darr also wrote a character letter, but he was the only one to testify in court. The sheriff said he has been receiving “some phone calls” and questions about his testimony and that is why he sent the letter to his staff and supporters. 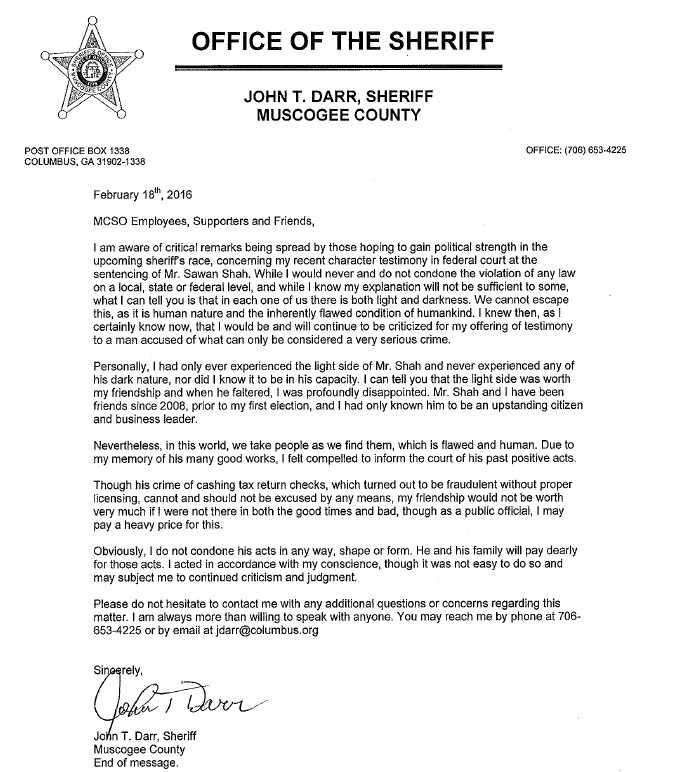 The sheriff had been working on the letter for some time and decided to finish it after a Thursday morning interview with the Ledger-Enquirer about his support of Shah. Darr has known Shah since 2008, and in 2012, state campaign records show Shah made a $2,400 contribution to the sheriff’s re-election bid. Darr has announced he will be seeking a third term later this year. Coming online Saturday night: The Ledger-Enquirer fought to gain access to character letters from elected officials in the criminal case of Sawan Shah. A federal judge earlier this month granted the newspaper access to 24 letters, including four from elected officials. We will report what we found.